Autumn is upon us and I'm beginning to looking ahead to Christmas time. Solomon's Knot will be returning to the Barbican on Monday 10 December at 7pm, where we gave our sold-out, 5* (The Times) debut in June: a performance of (JS and JC) Bach motets at St Giles Cripplegate for Bach Weekend. This time we will be performing our 'Christmas in Leipzig' programme in the Milton Court Concert Hall. The programme includes the Bach Magnificat which we last performed at the 2016 Leipzig BachFest in the Nikolaikirche. I'm sure the music is somewhere deeply embedded in my longterm memory, but I look forward to revisiting it over the coming months. Excitingly, this concert will be recorded live. Tickets may be purchased here. Alternatively, if you are in Nottingham the week before, come to St Mary's Church on Saturday 1 December at 7pm to hear us perform the same programme. Ticket's for our Nottingham performance can be purchased here. Sunshine, summer holidays and the small people in my life make for a neglected website. But thankfully I've been making lots of music recently as well. This coming Monday 20 August I'll be joining the BBC Singers for their BBC Proms concert at Cadogan Hall, conducted by Sakari Oramo. The programme is entitled 'The Sense of an Ending' and includes Hubert Parry's sublime Songs of Farewell. The next day I'll be heading up to Nottingham (with boys and husband in tow) for the Southwell Music Festival. The Festival, founded by the baritone and former chorister of Southwell Cathedral Marcus Farnsworth is now in its fifth year. Having missed all but one of the previous festivals because of bumps or babies or both, I'm delighted to be involved this time. Highlights include a performance of Tippett's 'A Child of our Time' and the Elgar Cello Concerto played by the formidably talented Sheku Kanneh-Mason. I've made some plans for a demo recording in the autumn and look forward to being able to share more recordings in the not-too-distant future. And somehow I thought it was a good idea to sign up to run a half-marathon. Think of me on Sunday 2nd September, as I run just over 21km through the streets and surrounding countryside of Maidenhead. I've found running great for boosting my energy and enthusiasm, both of which take a bit of a battering when one tries to balance the responsibilities of family life with maintaining a varied and interesting career. Delighted to have had some lovely reviews for our Bach Motets concert at St Giles Cripplegate on Saturday. And thanks to Jon Jacob in his Thoroughly Good Blog who also gave us a 5 star review! This was one of the most mentally exhausting projects I've ever been involved in! It was such a pleasure to sing that amazing music with such wonderful and communicative singers. A definite personal highlight. Can't wait for the next gig with Solomon's Knot. Next week, I'll be joining Solomon's Knot for their latest by-heart adrenalin-fuelled adventure: a performance of motets by not one Bach, but two, for Bach Weekend at the Barbican on Saturday 16 June. Johann Sebastian Bach (1685-1750) needs no introduction. The other Bach is JS's first cousin once removed, Johann Christoph Bach (1642-1703). JC was born in Arnstadt, where 61 years later in 1703, an 18 year old Johann Sebastian would take up his first proper job at the New Church (now known as the Bach Church). A mere 314 years later, Solomon's Knot visited Arnstadt to give our first performance of the Johannes-Passion from memory, last year in April 2017. After many performances of the Mass in B Minor, it's wonderful to be singing in German again with Solomon's Knot. Learning the music for this concert has not been without its challenges. While it must surely be one of the most musically complex programmes the group has ever taken on, it also promises to be one of the most rewarding. This year I now have another small and increasingly mobile person to look after which makes things that bit more challenging. So, JS followed us to West Wittering beach last week. He's always a welcome companion. Last night I joined with Solomon's Knot for our 5th from-memory and un-conducted performance of Bach's Mass in B minor, this time at St George's Bristol. It was our first trip to the west country and St George's provided us with a perfect venue and a warm and appreciative audience. Despite this being a repeat performance it felt no less exhilarating to us as performers than if it were our first performance. I will never tire of singing this glorious music with these wonderful musicians. Concert this Saturday! Very excited to be making my first ever trip to Liverpool to perform the soprano solos in Handel's Messiah with the combined choirs of Liverpool Cathedral and Liverpool Metropolitan Cathedral, in Liverpool Cathedral. The concert is on Saturday 12 May at 7.30pm. The Director of the Music at Liverpool Cathedral, Lee Ward, will conduct. 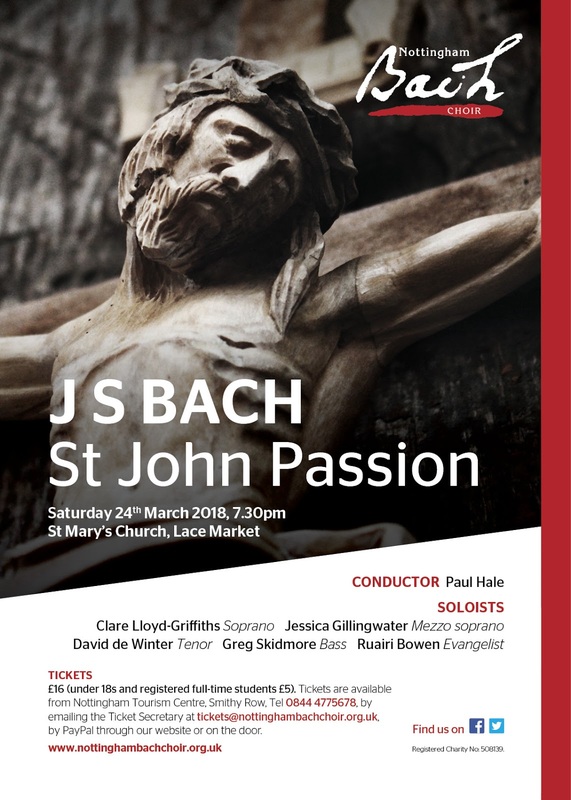 I am delighted to be joining the Nottingham Bach Choir, under the baton of Paul Hale, for their performance of JS Bach's St John Passion on Saturday 24 March, 7:30pm at St Mary's Church, Lace Market, Nottingham. The last time I sang this piece was Good Friday last year with Solomon's Knot at the Snape Maltings Concert Hall in Suffolk. I was very nearly 8 months pregnant with my now almost 10 month old younger son and I sang all the choruses as well as Zerfließe mein Herze. It was a memorable performance! This year, I get to enjoy Bach's awe-inspiring choruses as sung by the eminently well-qualified Nottingham Bach Choir. Please see their poster below for details of tickets.